About the project: This project is an example of the power of one architectural gesture to have a huge impact in a project with a small budget and a small footprint, physically and environmentally. Our clients, a family of three, wanted an addition to their existing dark, cold, mouldy Victorian terrace house. They didn't know how to achieve it, but they wanted their new extension to engage with the environment to provide passive comfort in a form and space that would lift their spirits. Their existing house was heritage listed meaning that at least the front two rooms had to be retained. The block was a narrow 6.5m wide and only 307m², with neighbouring walls on both side boundaries that overshadowed the site and stifled ventilation. The site sloped steeply from front to back, making the rear of the house more than a metre above natural ground. However, the biggest constraint was the orientation (north to the front) which made it difficult to get sunlight into the living rooms at the rear of the house. This was only exacerbated by the heritage requirements, narrowness, neighbouring walls and the sloping site. The owners had a modest budget of $330,000 including GST making it prohibitively expensive to use high end materials or even standard materials like a concrete slab on the sloping site. What our clients did have though was an insightful brief for a compact, clever home and an open mind to how we could achieve this. They were representative of the shift that we are finding in many clients for an emphasis on quality of space and light and environmental responsiveness in preference to big spaces. They were prepared to accept our suggestion that they didn't need a room for every function. They were keen to have flexibility. They didn't need many of the rooms that some consider a must have: an ensuite or a walk in robe, a laundry room, a second bathroom or even a second lounge. They were prepared to have one good sized bathroom incorporating a laundry in a cupboard and a second powder room. The third bedroom could be a guest / lounge and a home office for one of the owners who frequently works from home. They also represent our growing culture of flexible working location and hours and need for homes to provide a productive work space. The addition at the back required a creative response to the site challenges and orientation. The budget allowed for one key architectural gesture: to pop up the roof and then curve it up towards the north. The large highlight window catches warming winter sun and the perimeter of clerestory windows provides ambient light at all times of the day. Electrically operated highlight windows facilitate cross ventilation through the entire living space. The convex curve of the roof bounces direct sun light down into the living space while creating an illusion of space. The ramping form directs the eye up and outwards vertically creating a sense of space far greater than the modest 80m'² footprint. Meanwhile the long tail of the roof cantilevers over the back deck, drawing the living space out, bringing the outside in, and creating a feeling of length on the small site. The detailing is carefully considered to accentuate the curve and create a feeling of floating. 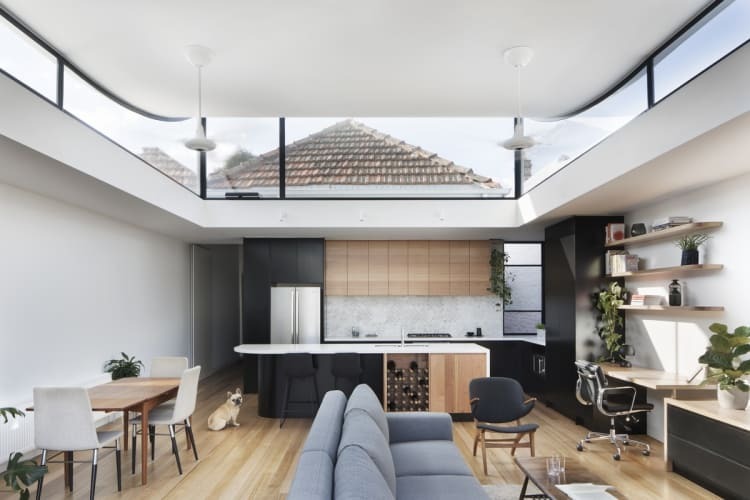 The slender structural frame and black steel windows detach the white ceiling from the house creating a sense of weightlessness. The curvy details continue in the benchtop, floating shelves and splashback tiles. The sunken deck flows down from the living room connecting the occupants with the natural environment and making use of the slope of the block as the floor level becomes a usable seat. Flip-top storage seats make use of every cubic centimetre of space. The heritage parts of the house are retained and celebrated. The original pitched tiled roof is framed by the highlight window as a striking reminder of the heritage context. The original hard plaster in the old lounge (converted into the bathroom) was peeled away to reveal the original brickwork wall where a curved brick lintel was a wonderful serendipitous find that becomes a feature of the new bathroom.